In the wonderful world of modern pool design, safety comes first. In conversation with Jason Nicholas Walsh, the owner of DIY Frameless Glass Systems and Absolut Custom Glass, Georgia Jordan explores how a thoughtfully designed border fence can bring exceptional security and beauty to your outdoor space. Owning a backyard pool brings with it endless benefits for your home and lifestyle, from providing an amazing visual feature, to enhancing your social activities in the great outdoors. By ensuring its design is every bit as safe as it is stunning, you can have confidence that your pool ownership experience will be nothing but bliss from the get-go. Creating an aquatic paradise that satisfies your council’s safety requirements without compromising on visual appeal can be a challenge, so read on as Sydney Pool + Outdoor Design investigates the smart design strategies, premium materials, and mindful maintenance procedures that you can employ for an optimum result. The pool ownership experience can only be fully enjoyed when you know your pool area is as safe as it can be. 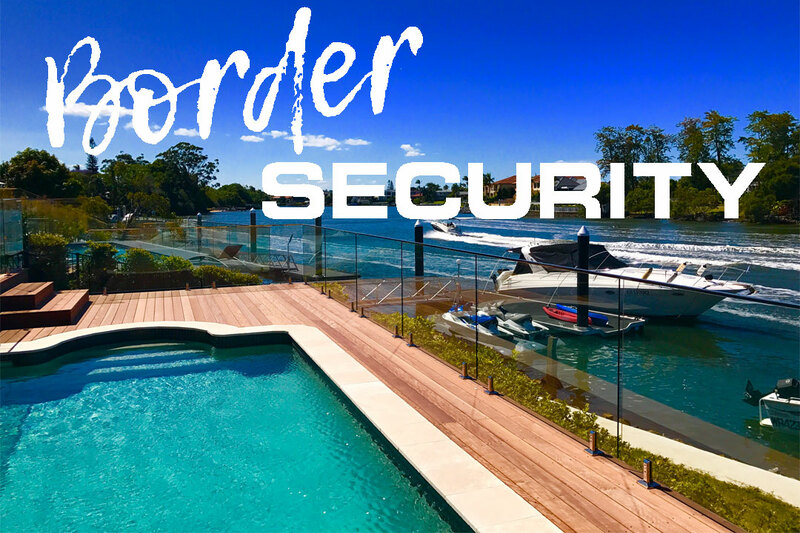 Providing peace of mind that your loved ones will never suffer an accident around the pool or spa, a secure border fence is a necessity. There are a multitude of styles available for pool fencing today, which gives you more opportunities to create a design that will perfectly complement your pool. For the best result, Walsh recommends basing your decision firstly on which type of barrier will best enhance the safety of your unique space, and then taking into account your budgetary requirements. While compliance with local fencing regulations always takes priority, Walsh says it is possible to achieve a barrier that enhances the visual appeal of your backyard as well, as long as you take your time during the design stages rather than rushing into construction. For a reliable barrier that provides uninterrupted views of the pool area and adds value to your property, glass is an excellent option. Renovators with their heart set on this sleek fencing style have two options to choose from – frameless and semi-frameless. and this is especially true if you are installing it yourself. In this case, it is important to consult a certifier prior to construction. “Semi-frameless glass fencing consists of panels that are dry-glazed into a series of posts,” says Walsh. “The glass commonly used for this type of installation is typically 8mm or 10mm thick – this does require more skill to install than frameless glass. Due to the thickness of the glass and the cost of the spigots – which are commonly manufactured out of high-strength, corrosion-resistant 2205 duplex stainless steel – frameless glass fencing can be the more expensive option, however it is often worth the added cost for the streamlined effect it provides. When constructing your new pool fence, you have the option of hiring an installer or doing it yourself. Whichever method you choose, it will be your responsibility to ensure the integrity of the barrier is upheld throughout each stage of its design and installation. 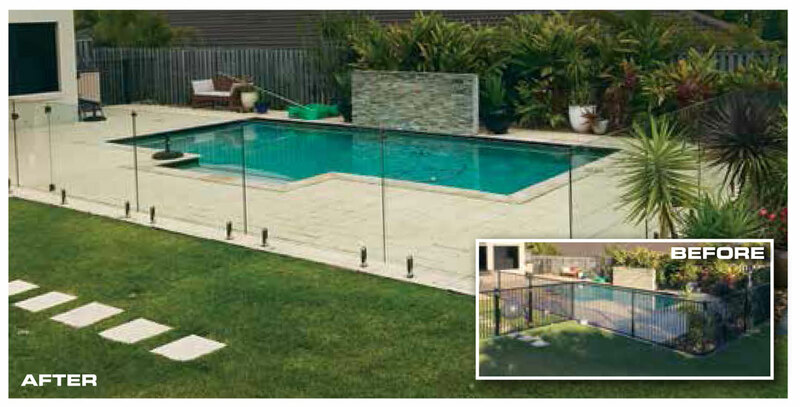 Even before you start thinking about how you will reconcile your council’s safety requirements with your aesthetic goals, it can be tricky to untangle all the rules that govern a compliant pool fence, and this is especially true if you are installing it yourself. In this case, it is important to consult a certifier prior to construction. A safety barrier is only as good as the parts that hold it together, so it’s imperative that you invest in products of the highest quality. Toughened glass is essential in pool fencing as it is unclimbable, and highly durable when used in combination with duplex stainless steel spigots. If you are going the DIY route, Walsh recommends visiting www.diyframelessglass.com.au for all the quality glass, hardware and fittings you’ll need for a superior result. “Building your own glass pool fence is more feasible than ever,” says Walsh, “but if you buy your materials from a company that pays no attention to detail then you might end up with a fence that has to be redone, or one that has unsightly pieces of Perspex or polycarbonate sheeting added to it. “Suppliers of glass fencing materials cannot guarantee that your fence will pass certification,” he continues. “Before you place your order, make sure that you have given as much information as possible about the design and its safety requirements to the retail supplier. Be mindful that trade suppliers will expect you to know the pool safety rules and may be less willing to assist with this. Age is one of the primary threats to the security of a pool fence. With proper use and maintenance, you can have faith that your barrier will continue to cut the mustard in the long term. Ensuring every component of your barrier is correctly cared for throughout its lifetime is key. “Latches and hinges may need to be replaced over time depending on their use,” says Walsh. “Learn how to properly adjust the self-closing hinges by watching one of the many online instructional videos so you know that your gate is secure at all times. “Stainless steel does require some maintenance and if you ever see any signs of discolouration, these should be removed with a wet cloth immediately,” says Walsh. “More stubborn blemishes may require a stainless steel cleaner, which is available from most supermarkets and hardware stores. Unfortunately Walsh says it is not uncommon to see pool fences propped or jammed open. Make keeping the gate closed the number-one rule in your household to ensure your pool fence fulfils its core purpose at all times. If there’s a home renovation or extension project ahead for you, it’s important to check how your pool fence may be affected, and whether you will need to make adjustments to ensure it remains compliant. As long as you have taken the utmost care in the design, installation and maintenance of your new safety barrier, and used quality products from the outset, you will be rewarded with a gorgeous pool area that delivers many years of enjoyment and peace of mind in equal measure.